The only way to safely transport your kayak is with a roof rack, they stop it bashing against the side of your trailer and damaging or scratching your boat. Recently, they’ve been getting more popular, as more competition has appeared and prices have gone down. But how do you choose which one is the best? This is built to last. It’s made out of high-strength steel, has a rust-resistant coating and has padding so you don’t have to worry about scratching your car. It has the capacity to carry two boats if their combined weight is less than 110 pounds. Great for if you want to go on a trip with a buddy. The high point of this guy has to be the price. It’s by far the cheapest on my list and still doesn’t fail to impress. One of the things I absolutely love about this guy is the lifetime warranty that comes with it. It comes with a free cart to put your kayak on when it’s off the rack, which is pretty sweet. Why do you need a roof rack? It’s all well and good owning a kayak, but if you can’t get it to the water then it’s no fun at all. A roof rack just makes transporting your boat around super easy. 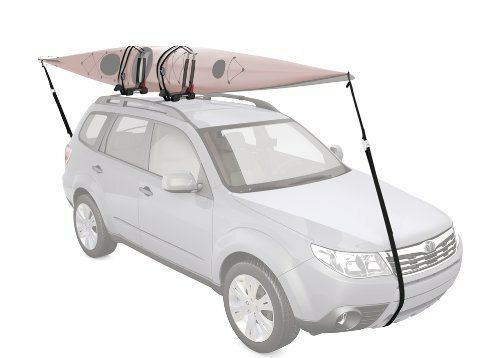 You attach the rack to the roof of your car and then whenever you want to go on a trip you just tie your kayak up and get going. Not only is this the easiest way to transport it, it’s also the safest. If you just have it in the back of a trailer it’s going to get slung about, hitting stuff and scratching or denting your boat or car. What makes some roof racks better than others? Are they universally compatible with all vehicles? Can they hold one boat or two? 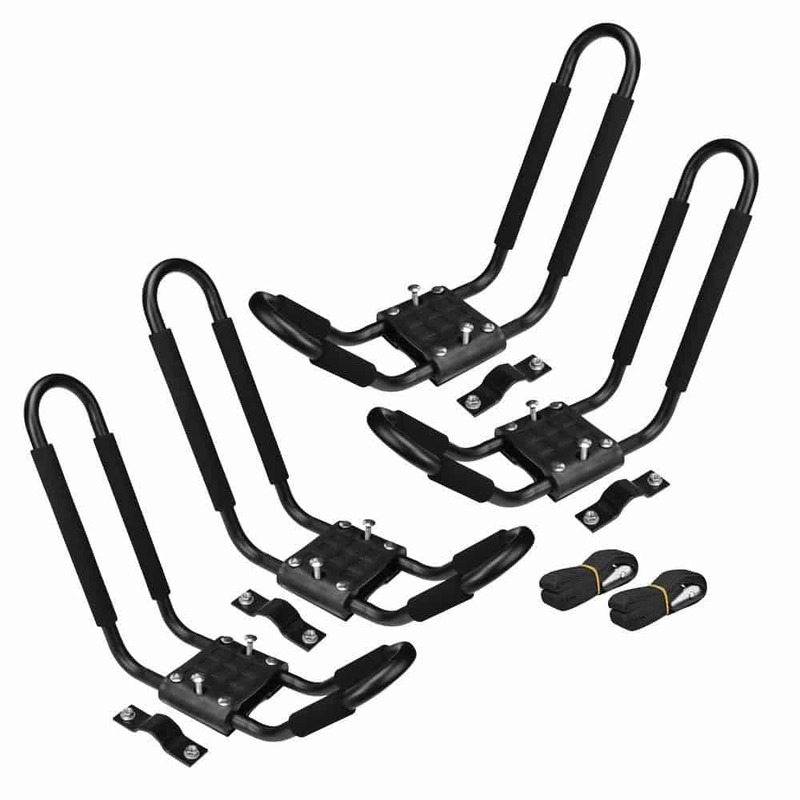 First thing to check out is if you need tools to attach it to your roof and that it’s compatible with your vehicle. Nothing’s worse than buying a rack only to find out that it doesn’t fit your car. After that, it all depends on the value you put on quality, style, and cost. This really depends on the kind of kayaking you do and on simple personal preferences. First things first, are you a solo kayaker or do you like paddling away with a friend? 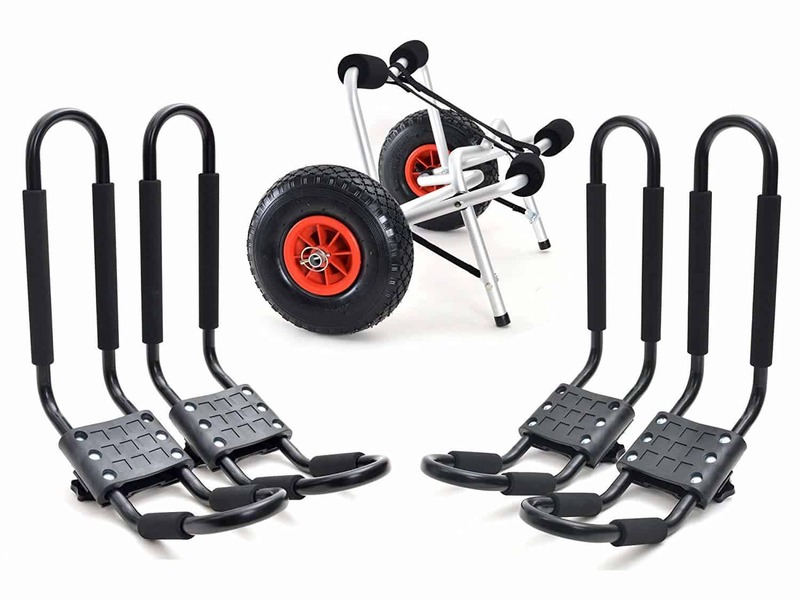 Decide whether you need one that can hold two boats or if a single holder will do the job for you. Next, give yourself a budget. How much do you really want to spend? If you can afford a bit extra you can get extra padding, easier installation and a more solid design. Finally, make sure you get one with a sturdy design and from a reputable company, and then there’s no reason why it shouldn’t last you forever. 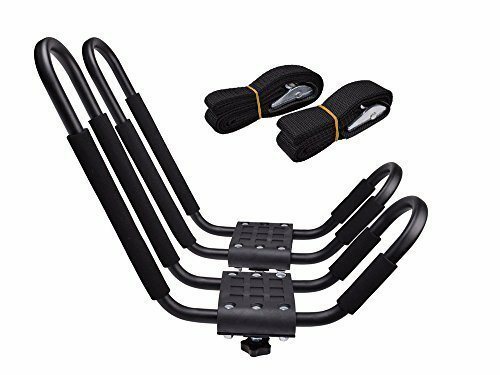 Best Kayak Roof Racks Reviews. 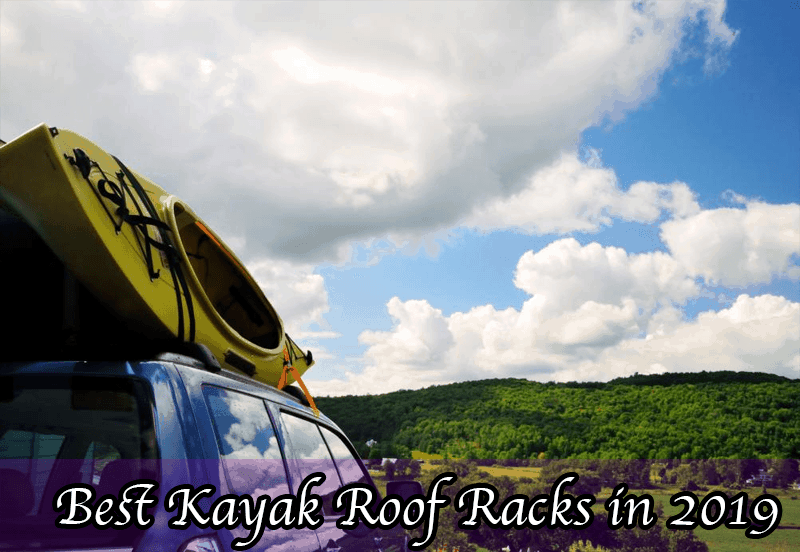 There are lots of kayak roof racks could possibly choose from but we have done an expansive research to reduce the stress of choosing the best one available. We will be mentioning some of them in subsequent paragraphs. One of the older models of roof racks, you can tell why this guys so popular. It’s pretty basic, but damn reliable and works well. Attaching or detaching the rack to your vehicle is super easy, so you don’t have to faff around for ages with it, like with some other models. This is one of the most compatible ones out there and fits almost every type of crossbar, so you know it’ll fit your ride just fine. The straps aren’t exactly heavy duty and look a bit flimsy but they do seem to work, so it’s not too much of an issue. If you’re looking for a basic model, that isn’t too fancy and doesn’t cost too much either then this is worth checking out. It’s nothing fancy, but it’s cheap and works. Bigger than most, and more expensive too, this is a serious bit of kit. You can for it to your roof rack without any tools, so there’s no worries about having the right equipment. The contact points of the rack are padded so that you don’t accidentally scratch or damage your vehicle. The only downside is the price. This definitely isn’t a cheap option, but considering it can carry two boats rather than one, it’s really not that bad either. If you have like to kayak in a group, with friends or family, then this is definitely one to consider. Being able to carry two boats rather than one is a complete game changer. While being a pretty standard model, this is a great example of a company getting the balance of quality and price just right. Built with a heavy duty steel, it’s a solid design and won’t be breaking any time soon at all. Also be wary of the name, this can fit one kayak on it and one only. Unfortunately, the fit for this isn’t quite as universal as the others, so make sure to check the dimensions fit your specific vehicle. If you want a roof rack but don’t want to shed out a load of money for one, then this is worth looking up. It’s cheap, durable and looks pretty sleek too. 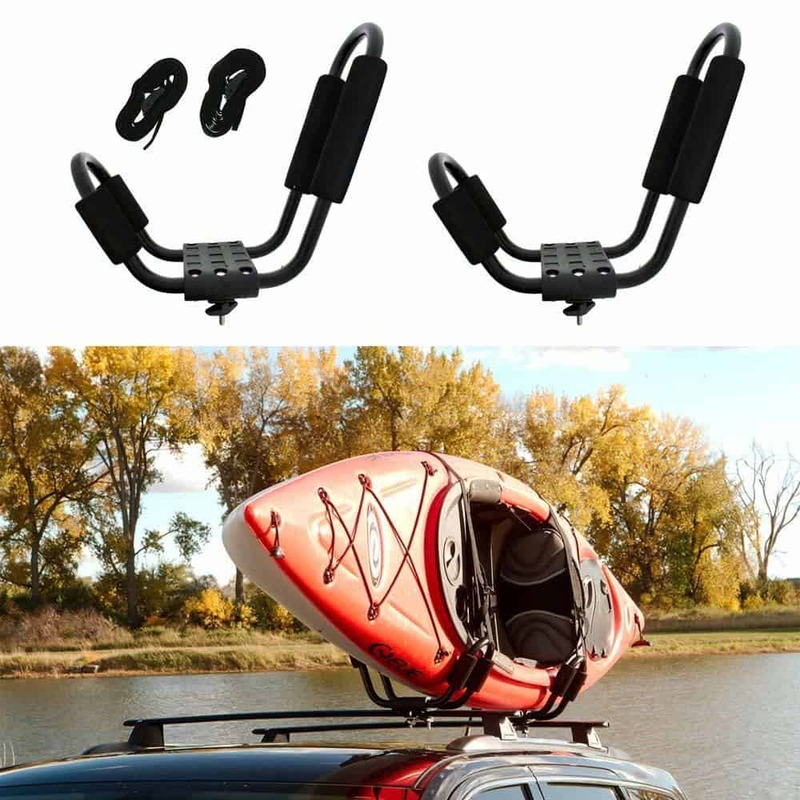 This is just an all-round great quality and well performing kayak holder. It does exactly what you need it to, and doesn’t cost too much either. One of the things I absolutely love about this guy is the lifetime warranty that comes with it. Not only does this give you that extra bit of peace of mind, it also just shows how much the company really believes in their product. The carrier is designed so that the kayak is stored on its side, meaning that the minimum amount of space is used up on the load bar. So you’ve got more room to attach all that other vital equipment too. Honestly, I couldn’t find any downfalls to this guy, it works well, is sturdy as hell and isn’t too expensive either. If you want a super reliable rack, but don’t want to splash out too much cash either, then you really can’t go wrong with this fella. One of the best out there, this mount isn’t so cheap, but it’s strong, easy to use and oozes style. It comes with a free cart to put your kayak on when it’s off the rack, which is pretty sweet. Saves you either lugging it around on your head or having to spend a bunch more money to buy one separately. This guys sturdy as hell. It’s built with aluminum anodized stainless steel and has padding too, so there’s no way you’re going to break it. It’s a bit more expensive than the others on the list, so you’ve got to be comfortable spending that bit extra, but for that, you do get damn good quality. If you’re the kind of person that likes getting the best of the best, then this is definitely one to consider. It’s got to be the TMS® Roof Top Crossbar. It’s a sweet looking rack that’s been built to last forever, and it comes with a lifetime warranty too, so even if something does happen, they’ll give you another one for free. The whole design of it is just fantastic, the way it stores your kayak on the side is just perfect for saving space so that you can fit other stuff up there too. And to finish it all off, it’s pretty damn cheap too.